The Boka Reflux still is a simple and effective design perfect for anyone looking for a small stove top still. 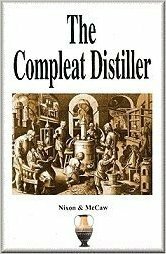 The construction of this still is relatively simple and by following the detailed plan below you shouldn’t have any problems building this homemade still at home. The Bokakob reflux still was originally designed by Alex Bokakob and is most popular with novice distillers because it’s easy to build at home, operation is straight forward and it can yield upwards of 95% ABV. This design uses Liquid Management (LM) to control reflux and so it is classified as a LM column reflux still. 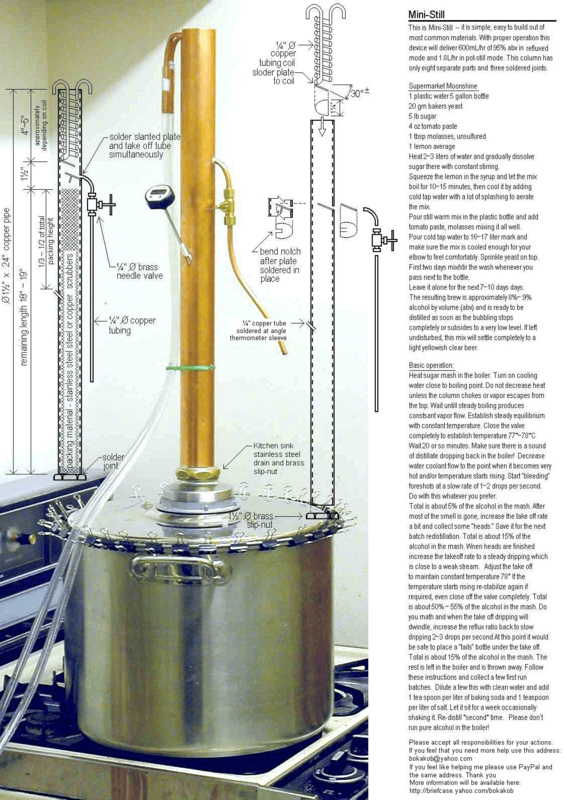 Below is a picture of the Boka Reflux still we’re going to build. I found this design online but couldn’t manage to find a simple guide for constructing it. Instead I found pages and pages of discussions on forms about the Boka reflux still lacking clear instructions about how to build it. So I decided to put together these simple step by step instructions to make it a bit easier. If you have any problems building this homemade still leave a comment at the bottom of the page with your issue and I’ll do my best to help. Once you’ve gathered the above materials and tools you are ready to build the still. Let’s start building. To start building the condenser coil grab the 1/4″ copper tubing and the wooden dowel. Tape the copper tubing to the dowel so that the tubing runs in the same direction as the dowel see photo’s below. Now bend the copper tubing around the dowel in a circular motion making sure not to kink the tubing. The coil must fit inside the column when were done so it’s important that you wrap the copper tubing tightly around the dowel. Once your done your condenser coil should look like this. This tutorial really get’s into it and show’s how to make a single and double coil condenser for your still. Finally you should check to see if it fits inside the column. It should slide freely inside the column. Print off this Slanted Plate Template (before you print it scale it down 25% as it was originally made for a 2″ column). Cut out the template and trace it onto the copper sheeting. Cut these plates out using a pair of tin snips. File the edges so they are smooth and all the burrs are removed. Next let’s cut the slots in the column for the upper and lower copper collecting plates we just made. These plates will collect distillate from the condenser and allow it to exit the reflux still via the needle valve. Using the template we printed off earlier trace out the slot on the column. Use a hack saw or Dremel with a cutting wheel to cut the slot in the column. If you use a grinder make sure the slot isn’t cut to wide. The plates should slide in with ease after your done. Using a pipe cutter cut the 1 1/2 ” copper pipe to 24″ long. Drill another 1/4″ hole below the upper plate. This will hold the Digital Thermometer. Drill two 1/4 ” holes on the top of the end cap. The inlet and outlet tubes of your condenser need to pass through these holes so it might be a good idea to line them up before drilling your holes. On a side note! it is possible to adjust the length of the column which can achieve slightly faster take off rates without sacrificing purity. Keep in mind the column length can only be optimized so far before resulting in diminished returns. Personally I like the performance of this design but if your the type that likes to have a hand in the design process check out these articles: Reflux Still Design Theory. For everyone else It’s time to solder everything together. If you’re not familiar with soldering copper have a read over this How to Guide For Soldering Copper before you start this section. Let’s start with the coil condenser, slide the condenser inlet and outlet tubes through the holes you drilled in the end cap and solder in place. The condenser should be tight against the top of the cap and should look like this. 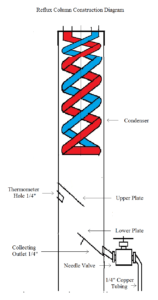 Slide the coil condenser into the top of the column. until the end cap fits nicely over the top of the column. **Note** “Do Not” solder the End Cap to the top of the column. We want to be able to remove the condenser for cleaning and not soldering this joint keeps pressure from building up within the column. Next let’s solder the plates into the column. Slide the upper and lower collector plates into the slots you cut and solder into place making sure they are fully sealed you don’t want moonshine leaking out. Cut a 4″ piece of 1/4 copper tubing and bend it to a 90 degree angel. Insert this end into the 1/4 ” hole you drilled just above the bottom of the collector plate. Solder this tube in place making sure the bend is facing down. Attach the Needle valve to the end of the 1/4″ tubing you just soldered onto the column. 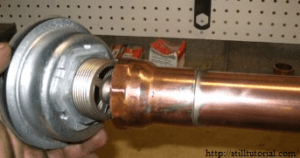 On the other side of the valve attach another 2″ piece of copper tubing. (This final piece will guide the end product into a collection container). Finally cut a 1/2 ” piece of 1/4″ tubing and solder it in the hole we drilled earlier just below the upper plate in the column. This will hold our thermometer. Here is a video that show’s the assembly of the Head assembly of the still! On the lid of your boiler, measure from side to side finding the exact center of your lid. Mark the center with an x. Now measure the radius of the widest part of the sink drain. From this number subtract 1\2″ ( this gives the sink drain a flange to fasten to you’ll see later). Set your protractor to this radius and then place the protractor in on the center mark of the lid and trace out a circle. Drill a small hole on the inside edge of the circle. Using a pair of tin snips or Dremel cut out the circle. Disassemble the sink drain and reassemble around lid of boiler with bottom of drain facing up. Remove the brass nut and flange from the bottom of the sink drain. Insert the brass flange into the bottom of the column and solder in place. The hard work is done, let’s go ahead and set up the still you’ve build to make sure everything is done. Attach the boiler lid to the column. Just hand tighten this connection as you’ll want to disassemble this later for storage. Attach 1/4 ” water line to the inlet and outlet of the condenser and fasten with hose clamps. Place digital thermometer into slot made between plates. You should now be ready to make some moonshine now. Just gotta get a sugar wash going now! If your confused about anything leave a comment below and I’ll do my best to help you. If your going to build this still make sure you let us know. I’d love to see your set up to! How to Use the Boka Reflux Still – ( Still working on getting this post up) If you’ve just built this still this is a must read. It will familiarize you with your homemade reflux still and teach you how to use it. Boka Reflux Still Plans – If you would like to print off these instructions off check out this condensed version it’s everything you need to know on one page. 20 Responses to "How To Build A Boka Reflux Still – Free Plan With Step by Step Instructions"
The sink drain will split in two pieces when you unscrew the nut in the center of it. Place the lid between these two pieces and fasten it back together same process as replacing your drain in your kitchen sink but in this case we’ve replaced your still lid with the sink. Where in the tower does the packing material go? The packing material goes between the lower plate and the bottom of the column. You can use either Stainless Steel or Copper scrubbers for packing material. Make sure you buy high quality one’s not from the dollar store. While I really like the simplicity and relative ease of construction in this design, I’m somewhat concerned over the potential for pressure buildup. With the soldering of the joints on the end cap (not evident in the original design photo) and at the base (sink drain), aside from the single needle valve, it would almost appear to be a ‘closed’ system insofar as if the LM valve were closed, could allow pressure to build up creating what seems to me would be safety issue. Is there perhaps someone who has assembled and operated this unit who could provide some insight? Thanks in advance to anyone able to respond for your time, effort and consideration in this regard. Your correct Steve when building a still the system must always be an open system. If pressure was allowed to build up within the still it could explode. With this design the coil condenser on the top of the still column should “Not” be soldered in place. I’ve added a note in the instructions to clarify this for others. This allows for easy cleaning of the top portion of the column and keeps pressure from building up within the system when the needle valve is closed. Hi Earl and Steve, I build my column and end-cap to be a tight fit, and I have also drilled a 1/8 ” hole in the top of the end-cap…It is a bit high off the floor to notice vapour, but I use a small mirror to check for condensation. The Still should never be sealed nor should it build pressure. The condenser knocks down any vapour, and I keep the needle valve closed until I have the upper thermometer on 78 to 81 degrees C, then run the methanol off first, about 300 ml per 80 liters of wash.
also as Earl says, it needs to be cleaned after doing a run, so I remove the condenser and and-cap to get into the top of the column. Does the boiler lid need to be sealable looking at the pict with all the clips? The lid doesn’t need to be sealed! You might get a small amount of vapour leaking but this is minimal. Send us some pics of your completed project and I’ll post them to our DIY Still Build Section..
Earl, Great instructions mate and thanks for posting I was wondering how long would it take to distill a 25 Ltr mash thru the Boka still? From start to finish about 6 hours.. Impressive, I currently use an air still and it takes 24 hours to distill a 25 Ltr mash so I will certainly be having a go at building a Boka, wish me luck! Earl is correct… I run 60 liters and it takearound 14 hours…so I refrain from tasting or testing too much during the run… one tends to lose a little concentration otherwise.. The scrubbers increase the surface area inside the column for vapor to condensate on. This will help you get a higher final proof ..
Could I use marbles in place of the copper or stainless scrubbers? Would it not have the same effect? Also, the kitchen drain to column attachment, is that made with an 1-1/2 female adapter? The directions says Remove the brass nut and flange from the bottom of the sink drain. Insert the brass flange into the bottom of the column and solder in place. I don’t understand this part. Thank you in advance. So I used most of this design. 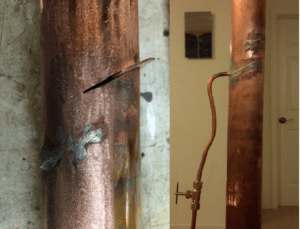 Instead of 1 1/2″ copper i went up to 3″ stainless sanitary pipe, because copper is expensive. I upped the length of the pipe to 3′ and the length of the condenser to roughly 9 3/4″. I am planning on using copper scrubbers for packing. I was curious if anyone has tried a still this big and if this person knew what to expect concerning quality and quantity.